These anonymous functions can only be called if they are associated with a variable as shown in the first example. They can also be called if they are provided as part of another function (such as setTimeOut) that knows what to do with them. 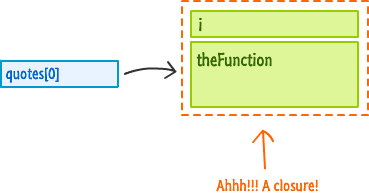 In this article, we are going to look at another function variation known as an Immediately Invoked Function Expression. Friends like us just call it IIFE (pronounced "iffy"). At first, what it does might seem a bit boring and unnecessary. As we get more familiar with it, I will describe some of its use cases and why you may find yourself both seeing and using these IIFEs a whole lot. By the end, IIFEs will probably still be very boring, but at least they will seem quite useful and necessary...hopefully! Go ahead and add these few lines of code and preview it in your browser. If everything worked properly, you will see I AM ALIVE!!! displayed. If things didn't work properly and you don't see that, make sure your many parentheses are in the correct locations. The most common illness that afflicts IIFEs are mismatched or misplaced parentheses! Anyway, now that you have created a working IIFE, let’s peel back the layers and look at what exactly is going on. At first, the most difficult thing to grasp about IIFE's is that they are nothing more than simple functions. These simple functions just happen to wear all sorts of crazy parentheses to help them execute immediately. Despite that, there are some minor differences in how you work with IIFEs. Once major minor difference is how you deal with passing in arguments, and so let's address that next! Just like with any function call, the order of the arguments you pass in maps to the order of the arguments in your function signature. If you run this in your browser (or run it in your mind), what gets displayed is My name is Bond, James Bond. And with this, you have learned the basics of how to write an IIFE. This is the easy part. The more interesting (and difficult) part is figuring out the cases when to use an IIFE. As you can see in this example, the foo variable, despite being stuck inside the if statement, is accessible outside of it because your if is not a scopable block. This ability to have your "supposedly inner" variables promoted and accessible to the entire enclosing function is known as variable hoisting! At this point, the value IIFEs bring to the table seems a little odd. After all, what is so different about an IIFE compared to a function you declare and call immediately like you have always done? The main difference is that an IIFE leaves behind no evidence of its existence after it has run. This is largely because IIFEs are anonymous functions that are nameless. This means you can't track them by examining variables. Because the code you put inside an IIFE is actually inside a function, any variables you declare are local to that function. Putting all of this together, an IIFE provides you with a very simple way of running code fully inside its own bubble and then disappearing without a trace. Now that you know what makes IIFEs unique (and extremely confusing), let's look at when you will need to use them. One of the biggest advantages IIFEs bring is their ability to insulate any code from outside interference. This is important if you are writing code that will be used widely in someone else's application. You want to ensure that any existing (or new) code doesn't accidentally clobber over your variables or override functions and methods. The way to ensure that such accidents don't happen is to wrap all of your code inside an IIFE. // just querying the DOM...like a boss! As highlighted in this example, just add the first and last line that wraps everything you are doing into a function that gets immediately executed. You don't have to make any additional modifications. Because all of the code inside the IIFE runs in its own scope and disappears, you don't have to worry about someone else creating their own copies of things found in your code and breaking your functionality. When the last line with the alert statement is executed, what would you expect to see? 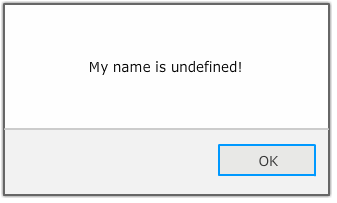 Because our person variable is getting the first item from the array of functions returned by peopleFunctions, it would seem reasonable to expect "My name is Tony Stark!" to appear. You will see undefined appearing instead of any person's name from the people array...much less the supposedly correct value of Tony Stark. What is going on here? Because the value of the i variable is actually referenced, the value of i that your closures reference is increased by one with each iteration of your for loop. That isn't the behavior we want. 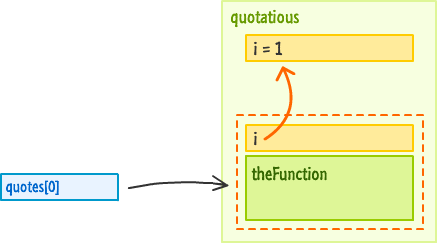 We want each function in the quotes array to store the value of i that it had when the function was first created. By the time our loop has fully run to completion, the value of i is 4. At this point, we understand what the code does and why it doesn't work as it is currently written. The solution is to lock in the value of our outer variable, the troublesome i, inside the closure. This will involve, as you might have guessed, the assistance of an IIFE. Notice that the i variable is passed in as an argument to our IIFE. This argument, now referenced inside the IIFE by the index variable, is local to whatever the function does. The state of what used to be an outer variable is now locked in! 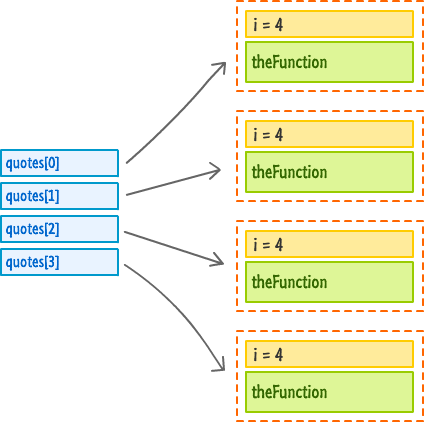 This change ensures that the function inside the quotes array has its own copy of the array index it needs so that the right person is being referenced. You no longer have references to outer variables that change and cause your code to break. W00t! Sometimes referencing outer variables is what you want! I am most certainly not saying to always use an IIFE when an outer variable changes after a closure has been created. There may be times where you want your closure to work with the updated value of an outer variable, so in those cases, don't use an IIFE to lock-in the value. You have an object called weakSauce that has two properties called secretCode and checkCode. This is a very naive password checker. When you pass in a code value to the checkCode function, it will check if what you entered matches the value of secretCode. If it matches, you are awesome will get displayed. If it isn’t, you are still awesome…despite what this code will tell you. 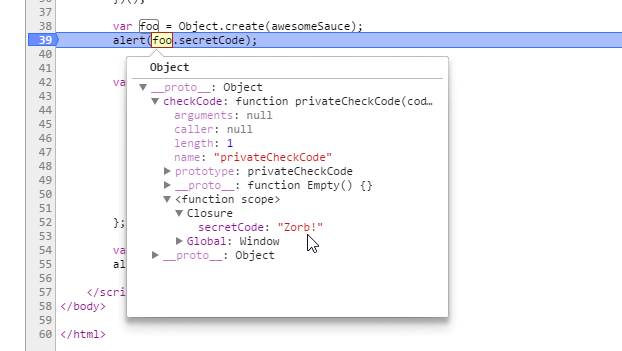 By only returning the checkCode property that internally references the privateCheckCode function (which is a closure), you get all the functionality you originally had while only exposing checkCode as the property in awesomeSauce that other parts of your app can safely access. There a more formal name for what I've just shown you here. 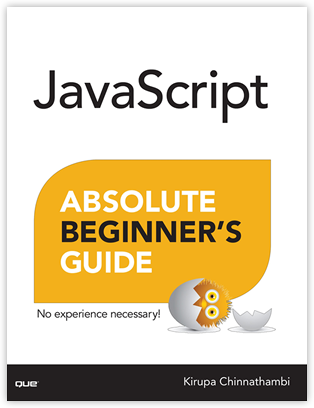 It's known as the Revealing Module Pattern, and there is a ton of good stuff on the net about it. My favorite is the following concise take of this pattern by Addy Osmani.